How Should We Honor Innovation 'Underdogs' Like Jacob Haish? A sample of "S" wire on display at the Ellwood House Museum in DeKalb. Barbed-wire "underdog" and prolific inventor Jacob Haish. When it comes to innovation, we remember the name that came out on top – no matter how good the “other” product was. Cyrus McCormick gained fame for his wheat reaper, but few people remember John Manny. When it comes to barbed wire, the name of Joseph Glidden springs to mind, along with his partner Isaac Ellwood. But not as many people are aware of the significance of Jacob Haish in the industry. The issue is this: How should we recognize contributors to our history when their names are not the ones at the top of the list? Jenna Dooley talks with Jessi Haish LaRue about research into Jacob Haish, who helped develop barbed wire. 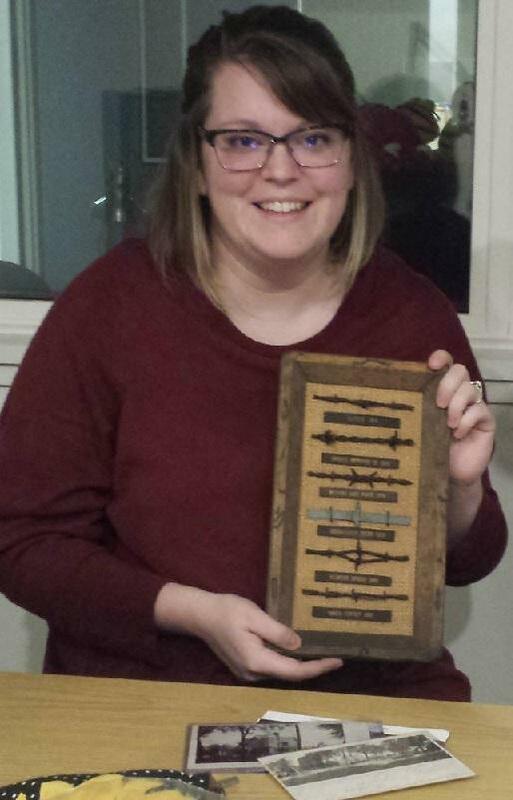 Sycamore writer Jessi Haish LaRue holds samples of different types of barbed wire. In her research, she found drama between Joseph Glidden and Jacob Haish in terms of who actually got those early patents in the 1870s. Jacob Haish even took his argument to the U.S. Supreme Court. He lost the battle but spent the rest of his life defending his role in the development of barbed wire. Haish also had several other patent ideas, including screens for windows and lights for railway cars. But many of his ideas were for farming implements. He developed a gasoline engine to replace horses. Haish also invented a type of manure spreader. "He was always looking to improve agriculture," LaRue explained, "which makes sense here in DeKalb County." Haish died less than three weeks shy of his 100th birthday. LaRue found an article from 1922 in the DeKalb Daily Chronicle where he celebrates his 96th birthday. "He also seemed really content toward the end and happy with the contributions he made to his community," LaRue said. "He always seemed very grateful and in love with DeKalb, and I think that's why he was always giving to DeKalb." 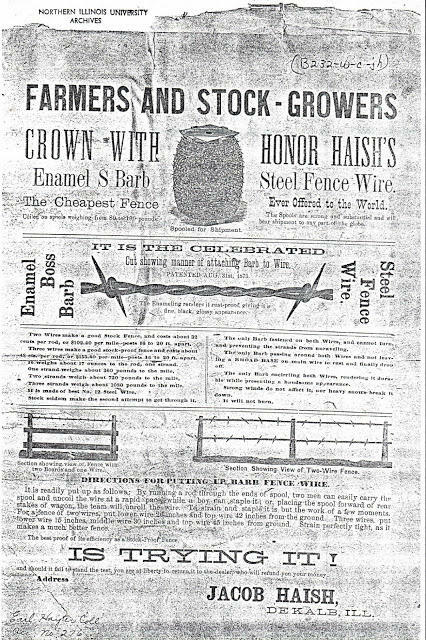 She also found an advertisement boasting that Haish’s “S” style barbed wire was "the cheapest fence ever offered to the world." This advertisement for Jacob Haish's barbed wire appeared in the Daily Chronicle in 1922. "I really think of him as an innovative salesman," LaRue said. "He printed the Barbed Fence Regulator, which was a pamphlet/magazine, and he distributed that; and it would have poems, and pictures of his barbed wire, and it was something no one else was really doing in the industry at that time. He always just seemed ahead of his time." Some people will recognize the Haish name through his contributions to the DeKalb public library and the local hospital. Haish did not have children and felt it was important to give his inheritance to charitable groups. "Because he died in 1926, they started building [the library] right at the beginning of the Great Depression," LaRue said. "Building this big, grand library at that time was completely unheard of. It's nice to see those things and see that name and know that his money is still being put to good use." LaRue stumbled on a description of Jacob Haish in the February 1900 edition of the "Northern Illinois," today known as the Northern Star, Northern Illinois University's campus newspaper. Mr. Haish's career seems phenomenal. It was due to labor, energy and perseverance. He made the most of his opportunities, was not extravagant, and is now reaping the rich reward of his labors. His greatest enjoyment is at his own fireside, where, with his wife and friends, he is found to be a delightful companion. He is retired and conservative before the public, and commands the respect and admiration of all who know him. LaRue says she hopes to continue to find more information about Jacob Haish that she can document online. "This always felt like this was my story to tell," LaRue said. "Haish doesn't have a museum like Glidden or Ellwood, he doesn't have a book or anything other than a name here or there, so he just seems so deserving of that." 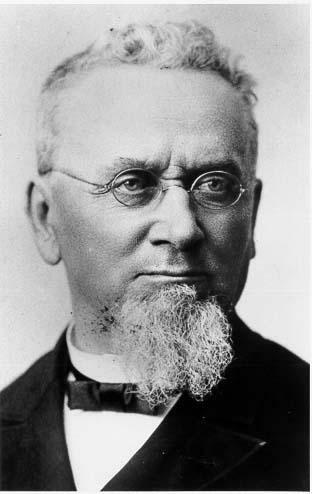 LaRue will give a presentation about her research into Jacob Haish at 2 p.m. Sunday, Sept. 10, at the Glidden Homestead in DeKalb.